In a medium bowl, mix the kosher salt, sugar and ground fennel seeds. Moisten half of the outer rim of 6 chilled white wine glasses with the lime wedge and coat lightly with the sweet fennel salt. In a blender, combine all of the remaining ingredients except the garnishes and blend until smooth. Pour the drink into the glasses. 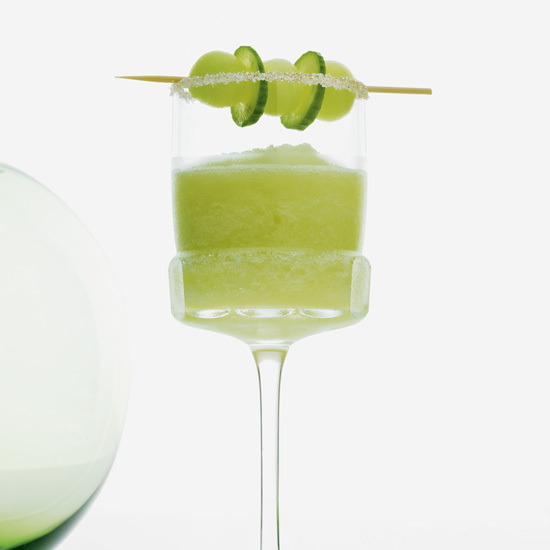 Garnish the drinks with the cucumber wheels and honeydew melon balls.